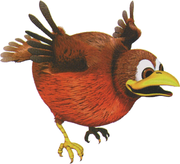 Artwork of a Booty Bird from Donkey Kong Country 3: Dixie Kong's Double Trouble! Booty Birds are extremely fat robin-like enemies from Donkey Kong Country 3: Dixie Kong's Double Trouble! and Donkey Kong Land III. As their name suggests, these obese birds carry various items in their belly, such as bananas, Bear Coins, or sometimes even a KONG Letter. They can be found in every world, in all kinds of areas, which shows that despite their weakness, they have an impressive adaptability. Booty Birds are often needed to reach Bonus Areas. They are actually quite slim once the Kongs make them spit out what they have in their bellies. Booty Birds can be defeated with any attack (except cartwheels) and are the only enemy that Parry the Parallel Bird can defeat. When attacked, they will chirp and fly away. Most Booty Birds hover in the air at one spot, but some of them fly back and forth. These birds are minor obstacles, and they can hardly be considered real enemies, except in the level Pot Hole Panic. It is unknown whether they are related to the Kremling Krew. Bounty Basses are the underwater counterparts of the Booty Birds. Sprite from Donkey Kong Country 3: Dixie Kong's Double Trouble! This page was last edited on April 4, 2019, at 00:35.